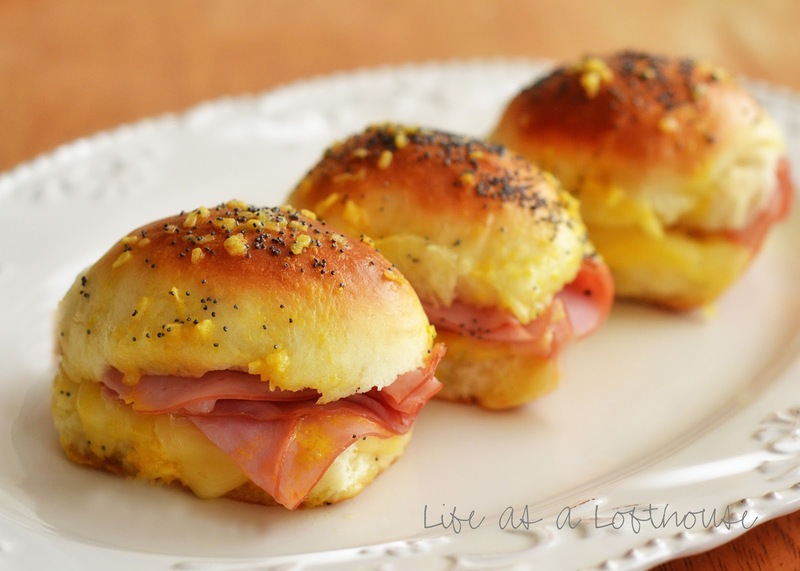 Ham and Cheese Sliders are savory and delicious baked ham sandwiches with a mustard poppy seed dressing. 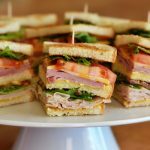 These little sandwiches are always a hit at parties and get togethers! These yummy sandwiches remind me of something my Grandma Jennings would have made for lunch on a Sunday after church. She was such a great cook. Thanksgiving dinners at her house were always elegant and amazing. She would set out all of her best china and silverware, and even use champagne glasses, but it was sparkling apple cider that filled the inside, never alcohol. I thought I was pretty cool drinking from those fancy glasses. To this day, every Thanksgiving I buy sparkling apple cider. It reminds me of her. Okay, so where was I? 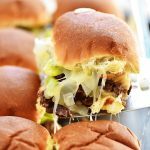 Oh yes, these sliders. They are so delicious. Definitely not the boring everyday ham and cheese sandwich. The poppyseed sauce that you drench over the top is what really makes these things wonderful! The flavor is excellent. These would be perfect to make for a baby or bridal shower, a church or work party, etc. I guarantee you will be asked the recipe! 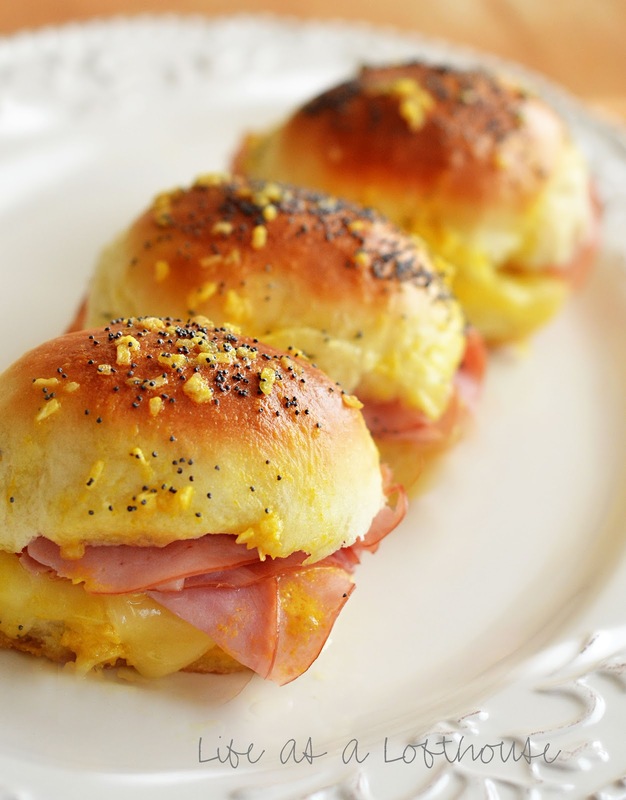 Hot ham and cheese sandwiches covered in a savory poppyseed mustard sauce. 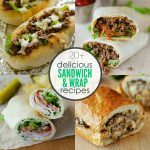 These sandwiches are a hit at any party! Cut the rolls down middle. Place bottom halves of rolls in a 9×13 baking dish. 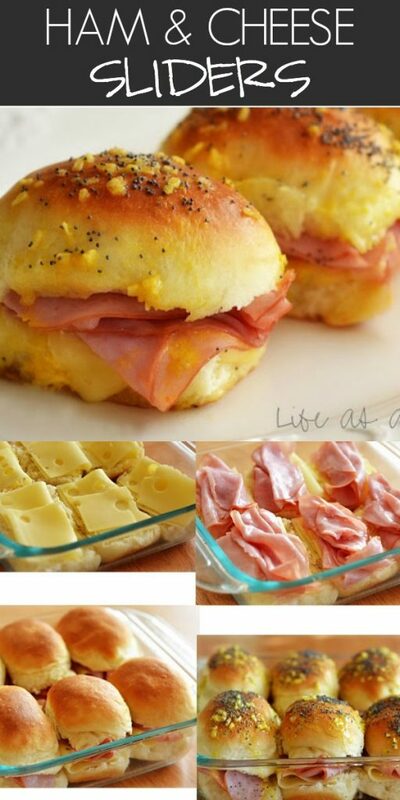 Top each bottom with one slice of ham and one slice of swiss cheese. Cover each roll with their top half. In a small microwave-safe bowl, melt the butter in the microwave. Whisk in the mustard, minced onion and worcestershire sauce ingredients. Carefully pour the sauce evenly over all of the rolls. Sprinkle the tops of rolls with the poppyseeds. Let stand about 10 minutes or until butter has set slightly. Cover the baking dish with foil and bake at 350 degrees for 12-15 minutes. Remove foil and place back into oven for 2 minutes or until cheese has completley melted. Serve warm. FREEZER INSTRUCTIONS: Prepare sandwiches as directed above. Do not bake. 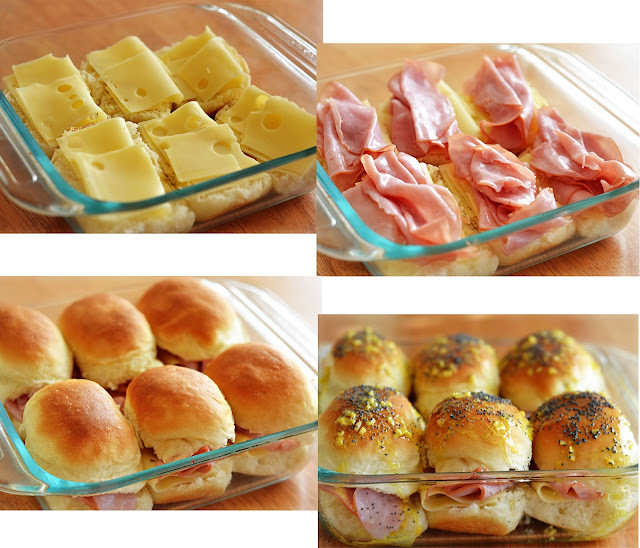 Place sandwiches in a freezer-safe bag or container and Freeze up to 2 months. To reheat: thaw sandwiches in the fridge up to 24 hours. Bake in a 350° F. oven for 20 – 30 minutes or until heated through. One of my co-workers makes something like this for our work gatherings (well, let’s be honest – his wife makes them). They are SO good! And its been a while since I’ve had them so thanks for the reminder! I love your recipes, by the way! I’ve made these, well, they are similar. The recipe I have doesn’t have poppy seeds. But seriously though, they are really, really good! A must-try! Ohhh, we LOVE these! MMMM…maybe I should make a run for the store and get the stuff to have them for lunch today….oh, oh, oh YUMMMM! These are adorable! I like the poppyseed sauce on top of the rolls to give them a little something extra. Yum. Those look fabulous. We make some in the summer on the grill, which reminds me I want to make them soon. These sounds and looks really good! The poppy seed sauce does look incredible! I could have this for lunch! 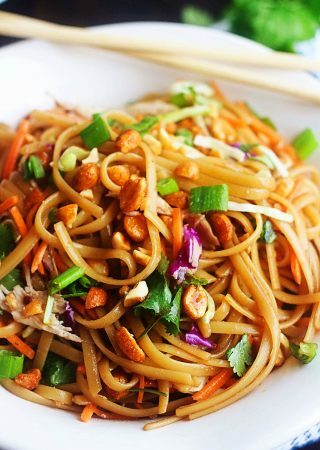 Thank you for sharing this lovely recipe! Those look great. I am especially intrigued by the poppy seed sauce. Sounds yummy! This is one I drooled over the first time I saw it, I bet so delish. I love these little sandwiches! Wish I had me some ham & cheese so I could make some right now! YUM! Pretty much one of my most favorite sandwiches. I’ve been making a version of these for years. They are so good. Thanks for posting this….I need to make them soon. Now these look perfect for a light weekend lunch. Thanks for sharing! These look like they would melt in your mouth- yum!!! Oh how cuuttee!! This is a nice little slider for one of the brunch options! You made it very nicely too. Great idea on poppy seed sauce! Holly, the pictures are making my mouth water. This looks so yummy. Once again your recipe rocks! Ohh what a mouthwatering photos Holly! I love how you put together these sliders, very well done!!! 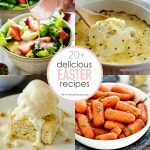 Those look delicious and I’m sure my kiddos would love them too. Just wanted to let you know that I’ve bestowed the Versatile Blogger Award on you. 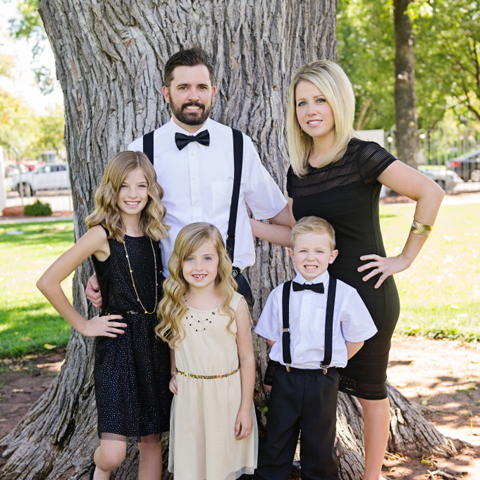 Stop by my site to check it out. I’m at whatthedogate.blogspot.com. I’ve made these ham sammies all week. They are amazing. Thanks for sharing!! I made these last night and they were fabulous!! I used 6 “Lite” Hamburger Buns (watching my figure!) and they worked out perfectly. Delicious! I can’t wait to eat the leftover for lunch today! Thanks for sharing! Made these this week and they were a huge hit! Should have doubled the batch. I used Hawaiian mini sub rolls and it was awesome. I have one non-ham eater in the house so I made hers with turkey and she said it was delish! Assembled 36 of these at lunch today. So easy and I can’t wait to try them; they look delicious!